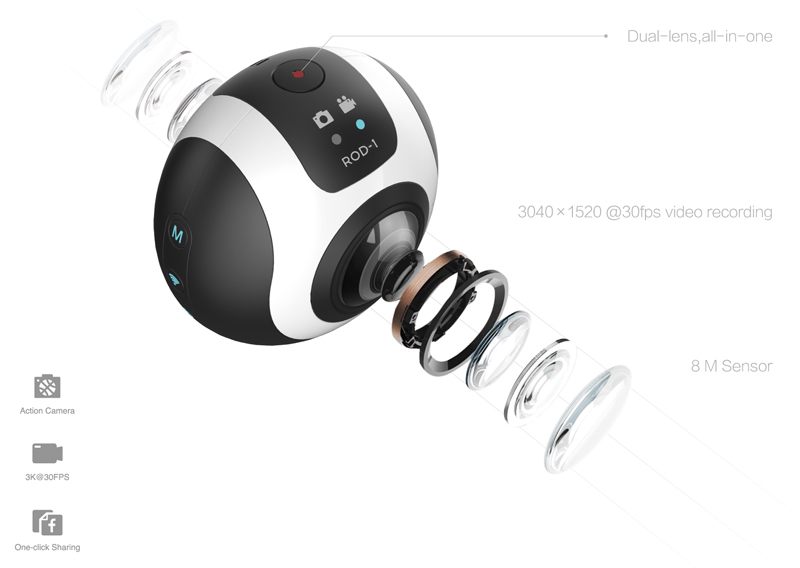 Licensor of signal processing IP for smarter, connected devices, CEVA, and Evomotion Technology have announced that the companies have collaborated to enable advanced imaging and computer vision features for Evomotion’s ROD-1/360°/720° dual-lens spherical camera. The ROD-1 is capable of taking 3k resolution 30fps videos and 4k resolution photos with panoramic stitching in real time, implemented on the CEVA-XM4 imaging and vision DSP, eliminating the need for post-processing on a smartphone or PC. The camera utilises Rockchip RV1108 visual processors, which include the CEVA-XM4 DSP to handle advanced imaging and computer vision tasks. Evomotion ported a range of imaging algorithms and high-performance stitching to the fully-programmable CEVA-XM4 using CEVA’s development environment and tools, supported by CEVA and Rockchip engineers. Following this successful project, CEVA and Evomotion intend to extend the partnership to include broader imaging solutions for dashcam, sports camera, SLAM and real-time 3D reconstruction in the future. CEVA will be demonstrating the Evomotion ROD-1 and other CEVA-powered products at the upcoming Mobile World Congress Shanghai, 28th June to 1st July. On CEVA’s booth W5.A33-35 visitors can meet the team and learn more about how CEVA’s signal processing IPs for communications, connectivity, imaging, vision and sound can help to truly differentiate next-gen products. CEVA’s latest generation imaging and vision DSP platforms address the extreme processing requirements and low power constraints of the most sophisticated machine learning and machine vision applications used in smartphones, surveillance, augmented reality, Sense and Avoid drones and self-driving cars. These DSP-based platforms include a hybrid architecture composed of scalar and vector DSP processors coupled with a comprehensive Application Development Kit (ADK) to streamline software deployment. The CEVA ADK includes: CEVA-Link for seamless software level integration with a host processor; a range of widely used and optimised software algorithms; the CEVA Deep Neural Network (CDNN2) real time Neural Network software framework which streamlines machine learning deployment at a fraction of the power consumption of the leading GPU-based systems, and development and debugging tools.